"On the 30th of May the regiment (with Companies G and K) left for Port Hudson, where they had a full share in the siege of that place. On the 14th of June followed the hand-grenade slaughter of the brave men under Capt. Bartlett, whose death has been duly noticed, in the attempt to take that fort. It was one of the deplorable mistakes of the Banks campaign, as a few days' time must have compelled a surrender of the rebels without the reckless loss of valuable lives, accomplishing nothing." The flag's extremely small size, at just two feet on the hoist and three feet on the fly, is very rare. Flags during this period were typically large, often more than eight feet in length. 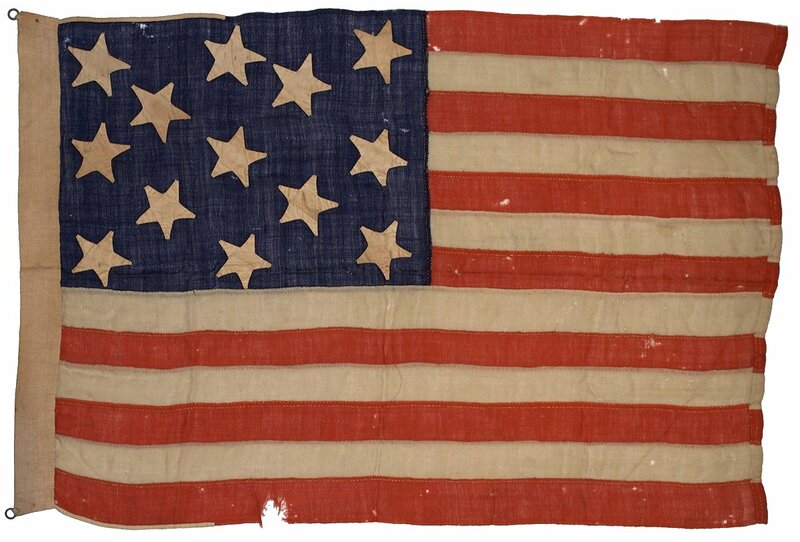 The flag is entirely hand sewn, which is a highly desirable trait in a thirteen star flag of any period. The wide canvas hoist is interesting and unusual, and the edge reinforcements that extend from the hoist along the top and bottom of the flag, to prevent the wool from tearing from the hoist, are unique in my experience. The colors of the flag are rich and vibrant. The canton is a deep blue with a tinge of purple hue, typical of Civil War era wool flags, and the red stripes are a deep ruby red color. The proportions of the canton, being half the length of the fly rather than typical one-third length, is another very attractive and striking feature of the flag. Although it might be suspected that the flag's length was longer and may have been turned back and re-stitched, examination shows that the current proportions of the flag are original and as intended. The irregular spacing of the stars, with their flat, blunt tips and haphazard rotation, results in a folky and beautiful presentation of the Hopkinson patterned thirteen star flag. 1 History of Bristol County, Massachusetts: With Biographical Sketches of Many of its Pioneers and Prominent Men, Part 2; by Duane Hamilton Hurd, Published by J. W. Lewis & Co., 1883.